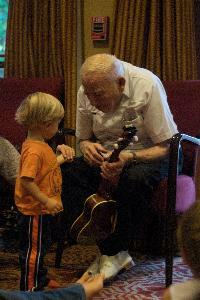 You're never too young, or too old, to enjoy music and creative movement with Kindermusik and Friends! It's a whole multi-generational, multi-level ensemble of Music, Movement, Rhythm, Song and Dance... and LOVE! 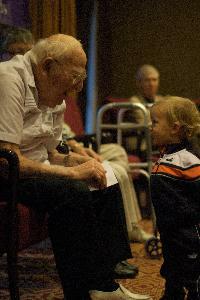 Unique and Endearing Music n Movement Classes w/ Seniors in Goleta and Montecito. GOLETA CLASSES at Maravilla meet Tuesdays 9:30-10:30am. Introducing Kindermusik with Kathy & Friends's Classes with Seniors, Families and Children of all ages together!! Now, we've taken Kindermusik with Kathy's supreme curriculum a step further - by bringing this magical, musical classroom into local senior centers and retirement communities. Many of the seniors claim this is their favorite day of the week...when they get to see and experience the exuberant JOY of musical, moving children, smile and touch hands with them...some seniors may even dance with us! Monthly Subscription value of only $55 + $30 for At-Home Music kits to enjoy music and games at home. Siblings 50% off!